Is cMirror one of the best social trading platforms? Find out in the review! 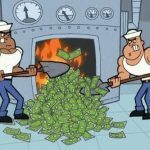 cMirror is a new and outstanding platform for mirror trading. 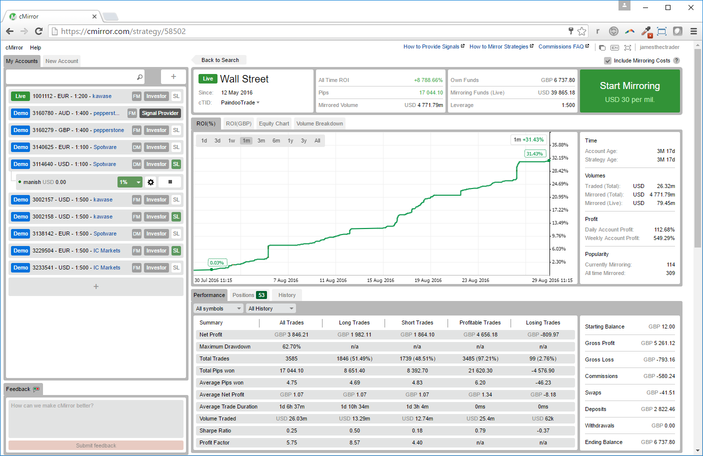 It was released in November 2014 by Spotware as a part of the cTrader Suite. Before going deeper into cMirror itself, we have to understand the whole infrastructure around it. cTrader provides full access to the currency and CFD trading markets for professional and new traders. One of the most important advantages of the cTrader platform is execution time: the orders are filled in fractions of a second. As a part of the same trading environment, cMirror inherits the execution time thereby making the mirror trading much more professional and, what is even more important, profitable. All parts of the cTrader solution, which includes cTrader, cAlgo, and, of course, cMirror, are joined under cTrader ID or cTID. Basically it is a single point of login that allows access to every part of the system and also share some common settings. 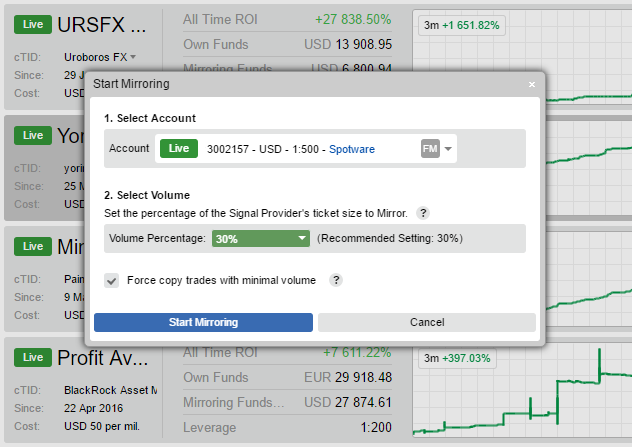 In order to start working with cMirror, all you need to do is open cTrader account. Keep in mind that all the brokers, which offer cTrader, are offering cMirror, but not necessarily at the same level. By default, you will be able to follow any of the provided Strategy regardless of the broker. Although, there are different types of broker’s membership in cMirror. Demo Member Broker: Traders can only mirror demo and live strategies which do not charge commissions or become a free Signal Provider. Guest member broker: Traders cannot mirror any strategies or become a Signal Provider with this account. All they can do is navigate the interface. Considering the above information, it would be a good idea to ask broker about their type of membership for cMirror before starting the account. Choose one of the cTrader brokers and ask them about their membership! cMirror differs from social trading platforms we are used to due to the missing social component. cMirror is positioned as professional mirror trading platform. This might at first seems like a disadvantage, but if you think more, you can see that, by taking away the social component, Spotware has changed the paradigm of social trading. cMirror is not the community for traders to share their successes or discuss news. It is an innovative tool for providing trading signals to a vast community with a strong focus on trading strategies, analysis and advanced risk management. cMirror is absolutely broker agnostic. It means that there is no need for signal provider and investor to be enlisted with the same broker. This feature not only saves time for the investors, since they don’t have to start accounts with different brokers every time they would like to mirror another strategy, but also it allows to save money, since investor can keep all the funds under control within one account. More than that, when trader decides to follow a strategy, cMirror will recommend the safe volume percentage to mirror, based on other strategies already being followed and difference in resources with the strategy provider. cMirror offers to traders full transparency showing complete trading history and open positions. It is topped off with the advanced analytics, which visually display ROI charts, Balance & Equity Charts and Volume Breakdown. The charts can be adjusted to show information for selected time periods. Investors can include mirroring costs to provide a true indication of their ROI when following a strategy. 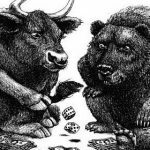 All this allows traders to make an informed decision while choosing the correct strategy. Another exciting feature of cMirror is the ability of Signal Providers to choose how much to charge their followers. The charge is based on investors’ traded volumes. So if the strategy is dead, the follower will not be charged at all. Also, if a trader chooses to follow the strategy only for the certain percentage, it is his volumes that will be taking into consideration while counting the commission. 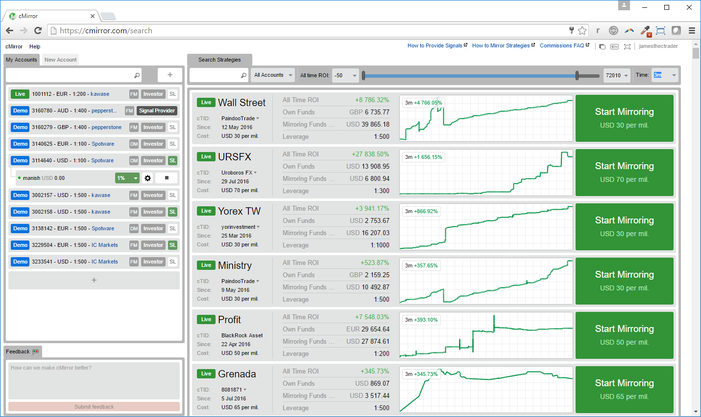 Traders can use demo accounts to follow paid strategies. They can do it for as long as they want with no charges involved to make sure that this strategy will be profitable when going ahead with a live account. As we said before, cMirror was created as a professional mirror trading tool. There are no buttons to like, share or comment anyone’s strategy. There are only numbers that should speak for themselves. In cMirror every trader can easily become a signal provider for the investors from all over the world regardless of the broker. More than that, one provider can offer several different strategies. This fact along with growing popularity of cTrader among brokers and traders brings a number of potential users to the hundreds of thousands. The risk management system is an essential part of cMirror. Investors can choose to mirror a specific percentage of the strategy provider allowing them to base their decision on balance, leverage, other strategies being followed and personal investment goals. Also the signal followers can apply a forcing Stop Loss and Take Profit in Pips which will take effect when a position reaches it regardless of the Strategy Providers intent. Investors remain control over their accounts at all times. They can close or modify any positions opened by a strategy provider as well as reconfigure their risk management settings and start and stop mirroring at any time. There is also an interesting feature that allows you to trade in a direction opposite to the one provided in the strategy. So even the most unsuccessful strategies can become handy after all. Spotware puts great effort in providing great customer experience. The company’s catch phrase says “Traders first” and this is indeed so. 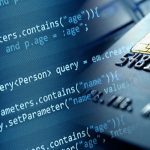 The whole development process is built based on the traders’ opinions and feedback, which leads to customer support being one of the most important parts of their business. Within cMirror platform you can find several links to detailed support documentation. Besides that, you can send feedback about the platform directly to Spotware from inside the platform. Traders are encouraged to use this feature to report bugs, ask questions or express their concerns and ideas. Also, there is a user voice page, in which traders can put their suggestions to be voted on. That is how Spotware determines which features are to be developed first. The money earned as a Signal Provider will be deposited into the account from which was used to broadcast the strategy and are paid every midnight according to server time (UTC). Those funds can be then acquired using the regular withdrawal procedure of your broker.